President Barack Obama will address the nation Tuesday evening to officially announce that combat operations in Iraq have come to an end, and that the drawdown of 90,000 U.S. troops is underway. When completed, a military presence of 50,000 troops will remain to assist the Iraqi government in keeping the peace. The real question about Obama's speech is, will anyone be watching. Americans have simply grown bored, tired and indifferent to the Iraq War. Truth be told, it never felt like the nation was at war, except to the soldiers fighting it or to their families. On any given day, in any given city or town these past seven years, one would be hard-pressed to find the sort of collective awareness, unity and patriotism of World War II, or even the turbulence, outrage and protest of Vietnam. Americans simply went about their business, with no personal sacrifice. Housing prices skyrocketed, stock prices soared, personal wealth grew and then the bottom eventually fell out. And now, as Obama proudly goes before the cameras to boast of delivering on his promise to bring the troops home, does anyone really care? They're more worried about their homes, their savings and their jobs. Once again, it's the economy, stupid! Sorry, prez, but America tuned out of Iraq years ago. For the record, I care very much about Iraq and the toll it's taken on our country, as do many other Democrats who opposed the war from the start. In seven years, over 4400 troops were killed, almost 40,000 injured or maimed, and we've spent close to $1-trillion. But those are just the obvious, and very unfortunate, stats. The war has had tremendous impact on so many other aspects of American life as well. Ever since former President George W. Bush invaded Iraq under what as much as half the population believes was false and/or manufactured pretenses, the war has served to divide the country like no other event in history. It has driven a sharp political wedge straight down both Pennsylvania Avenue and Main Street. America has never been as polarized as it is now. Washington has never been as partisan. The vitriolic relationship between Red and Blue America no doubt has the war as its genesis. Bush, the self-anointed uniter, just may go down in history as the greatest divider we've ever had. The war has also ravaged the U.S. economy. The $1-trillion cost, coupled with Bush's tax cuts for the wealthy which cost $2.5-trillion, have done more to balloon our deficit than health care reform, the economic stimulus package or any other of Obama's spending initiatives. Another cost of the Iraq war is the distraction it's been from our mission in Afghanistan, where we took our eye off the real enemy, Osama bin Laden and al Qaeda, who experts believe were able to cross into Pakistan and base themselves there as a result. The Afghanistan war is now nine years old, with no clear mission or end in sight, and with the country mired by increasing violence and political corruption. Fourteen U.S. soldiers have been killed there in just the last several days alone. It's an undisputed mess. 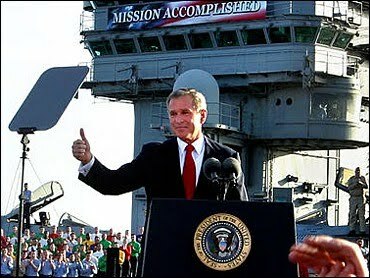 As for Iraq itself, Obama will not be using the term "mission accomplished" in his speech for a reason. That's because the mission is not accomplished, and won't be until Iraq can demonstrate in a lasting way that it can protect its citizens and sustain its fragile Democracy using its own police and military forces. To be sure, as David Brooks and Paul Wolfowitz wrote in their Tuesday NY Times op-eds, there has been much political, social, economic and national security progress made in Iraq, which is definitely a reason to celebrate. But it will take a couple of years at least before we can truly celebrate the success of this war. The fact is, Iraq is stuck in a six-month post-election stalemate, and, insurgent violence persists, as the recent coordinated multi-city terror attacks which killed 60 demonstrates. Lastly, there is still the great risk of civil war amongst the Sunni, Shiite and Kurdish factions which all have a great stake in Iraq's delicate balance of power. On another note, get ready for the Adrienne Shelly Foundation's 3rd Annual eBay Auction which launches September 24th. Wanna go to exclusive, one-on-one lunches with stars like Paul Rudd, Jon Hamm, Cheryl Hines, Michelle Williams, Kevin Smith, Rosario Dawson, Patricia Clarkson, Rachael Harris, Keri Russell, Susie Essman, Bill Hader, Jeremy Sisto, Mark Cuban among others? Or how about VIP tickets and meet/greet to Joan Rivers' new stand-up show? We'll also be offering VIP tickets to THE COLBERT REPORT, THE DAILY SHOW, RACHEL RAY, ELLEN, Maroon 5 and Jimmy Buffett concerts; plus TV show set visits/meet & greets for THE GOOD WIFE, HUNG, NURSE JACKIE, RIZZOLI & ISLES, BREAKING BAD; CASTLE and UNITES STATES OF TARA; walk-on extra roles on COMMUNITY and IN PLAIN SIGHT; as well as movie walk-ons. Mark your calendars for September 24! I find it interesting that in a article with the words: "The True Cost of the Iraq War" in the headline, there is no mention of the REAL tragedy of this illegal invasion: the 1.3 million Iraqi men, women and children slaughtered. Honestly, the surge was a battle for improving a War, not winning it. Thank God we are getting out, what a waste of our Youth and Treasury set on a bed of lies. surprises me, coming from you Andy.